DivX has announced a new free software package which simplifies watching and sharing high-definition content. The follow-up to DivX 7, DivX has decided to call it DivX Plus Software. The bundle is made up of four separate pieces of DivX software. These are: DivX Plus Player, the DivX Plus Web Player, the DivX Plus Codec Pack, and the DivX Plus Converter. DivX has redesigned its interface so if you are playing back DivX footage online or from the desktop it should be a simpler process. There's also the addition of smoother fast-forwarding and rewinding and if the file you are watching doesn't have chapter points, then DivX will automatically sort this out for you. And it now supports 1080p HD H.264-based videos in the MKV file format. DivX has also made file transfering that little bit easier. When you want to transfer files, all you have to do to make this work, is drag the file into the DivX To Go feature on the DivX Plus Player. The file will then be able to play in all DivX certified devices - no matter what version of the codec your hardware supports. If you want to drill a bit deeper into conversion - the DivX Plus Converter is for you. Formally something you had to pay for, DivX is now giving away a cut-down version for free. "DivX Plus software represents a major step forward in our mission to create a seamless, high-quality media experience that empowers consumers to enjoy the content they care about not just on the computer but on any device in their lifestyle," explained Kevin Hell, CEO of DivX. "Our new software connects the content that millions of users watch on their PCs to the millions of DivX devices all over the world, offering a bridge between the Internet and the living room." The software bundle is available now. 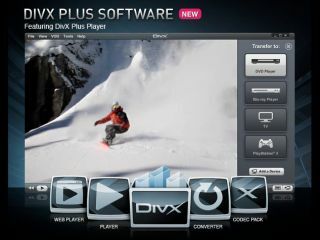 For more information, visit www.divx.com/software/divx-plus.